60% cotton/40% polyester. Ladies' fit designed to be lightweight without the bulk. Performance benefits include Dri-Power® moisture wicking technology, odor protection, and a UPF 30+ rating. Pad print label. "R RUSSELL" on left sleeve end. Front zipper and front pouch pocket. Hood with drawcord. 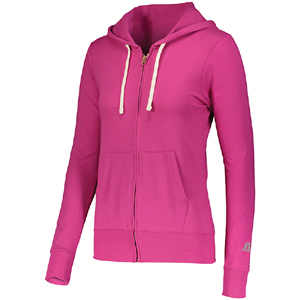 A classic full-zip design that has the comfort of cotton with benefits of performance.